OC Inc. Posts in category: "Children"
UCC Media Justice participated today in a tweet chat, co-sponsored by the Digital Ads campaign, which is a joint project of Center for Digital Democracy and Berkeley Media Studies Group, discussing the negative impact digital advertising has on children, and in particular children of color. There is much to be said on this topic, including the horrible immorality of targeting children whose health is already in danger. According to the CDC, 17% of kids today obese, higher for African Americans and Latinos: 22% and 20%; 1 in 5 kids! As the American Academy of Pediatrics noted, exposure to advertising is associated w/ child obesity, poor nutrition, and cigarettes & alcohol. Digital marketing takes advantage of big data to target children in subtle ways. Extensive studies show that younger kids have a hard time understanding advertising -- that the advertisers do not have their best interest at heart in the same way that a teacher who gives advice has. In addition, the tweet chat discussed new marketing techniques using neuroscience to subtly reach around parents into a teen's subconscious to make unhealthful food more desirable. And digital marketing is ubiquitous, as children spend more and more time online. Digital advertising directed toward kids is based also on the techniques perfected by Big Data, which has begun to gain the attention of the civil rights community. An important safeguard is giving users, including parents, control over their own data. While data can be helpful, it can also target communities and individuals in harmful ways. A large number of public interest organizations encouraged the White House to consider health in its current study of Big Data. Studies have shown that children of color are on the receiving end of much more advertising than white children. For example, a recent study by researcher Dale Kunkel showed that more than 84% of all foods and beverages advertised to children on Spanish-language television shows are unhealthy. Another study showed African American children and teens see at least 50% more fast food ads than their white peers. There are more resources online to learn about this issue. Salud Today has several great online videos about junk food marketing to Latino children, including this one. We particularly liked the Rudd Center's resources, including one on the challenges of weight bias and bullying directed toward kids who are overweight, and this report that discusses marketing to African American and Latino children. 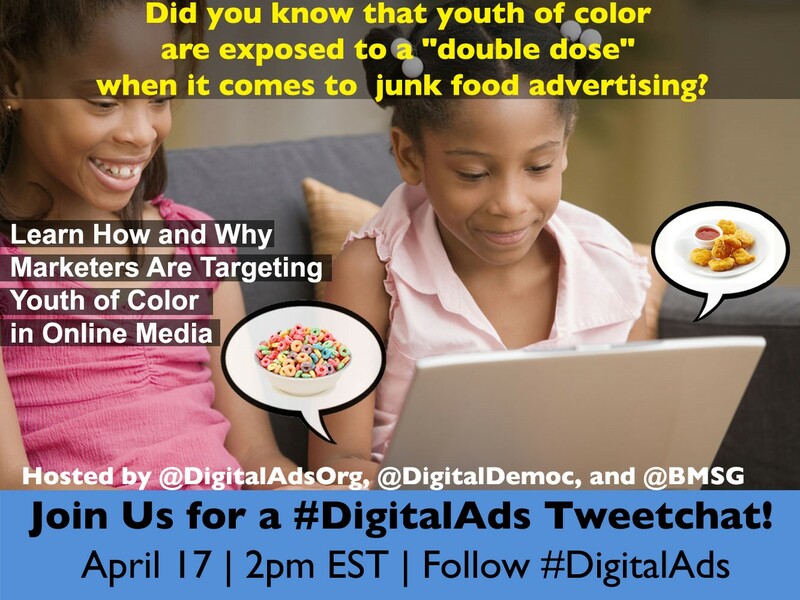 #socialjustice & #mediajustice mean treating all fairly -- don't target youth of color with junk food #digitalads harming their health! Check out all the great information shared in the tweet chat by searching #DigitalAds and visiting http://www.digitalads.org/ online. While the Supreme Court today found that the Federal Communications Commission’s procedures were flawed, it did not reverse course on the fundamental constitutional doctrine underpinning the regulations protecting children in the media. This decision thus permits further action on some of the most important issues relating to children and media today--whether it is the relationship of the media marketplace to childhood obesity, aggressive and inappropriate advertising, or the limited amounts of high-quality educational television for children of all backgrounds. We are gratified that the Supreme Court heeded the call of the Children’s Media Policy Coalition and left this critical doctrine intact. UCC OC Inc. encourages the Commission to use its authority in a manner that offers clarity to broadcasters and parents alike. 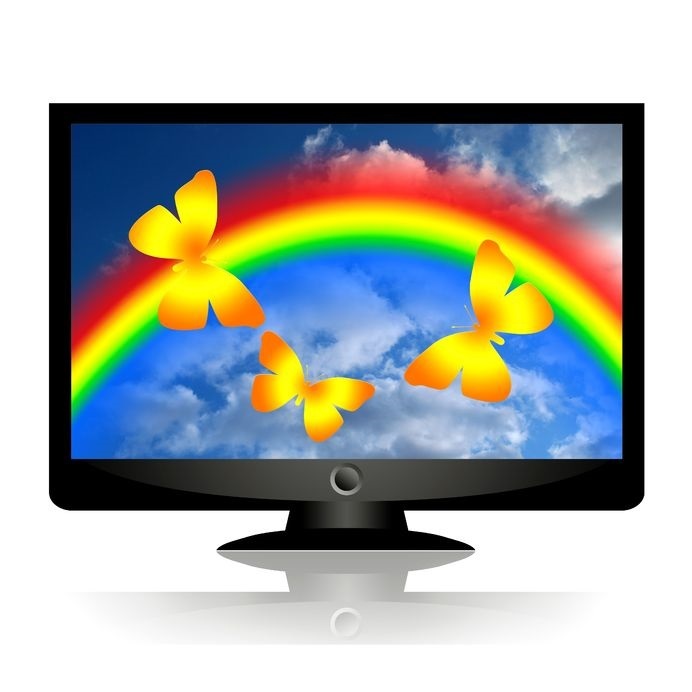 UCC OC Inc. filed an amicus brief in this case as part of the Children’s Media Policy Coalition.